Here in Pennsylvania, so many of us are looking forward to spring and making plans for warmer weather. 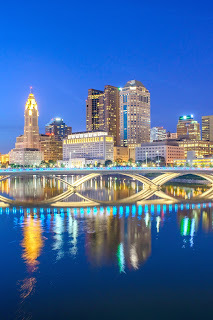 If you're deciding where to go this year, you may want to check out what Columbus, Ohio has to offer. I visited the area last year and found plenty to do and see, but due to limited time, I had to pick and choose carefully. If you have the opportunity to visit, you may want to consider adding a few of these options to your list. 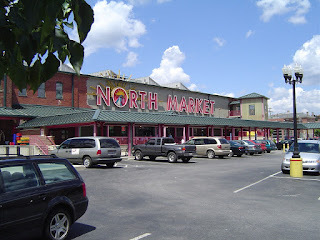 North Market. Photo courtesy Brand Columbus. 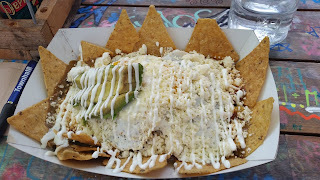 Because I knew I'd be hungry after a six-hour drive, I decided that the first order of business should be a visit to the North Market located downtown. 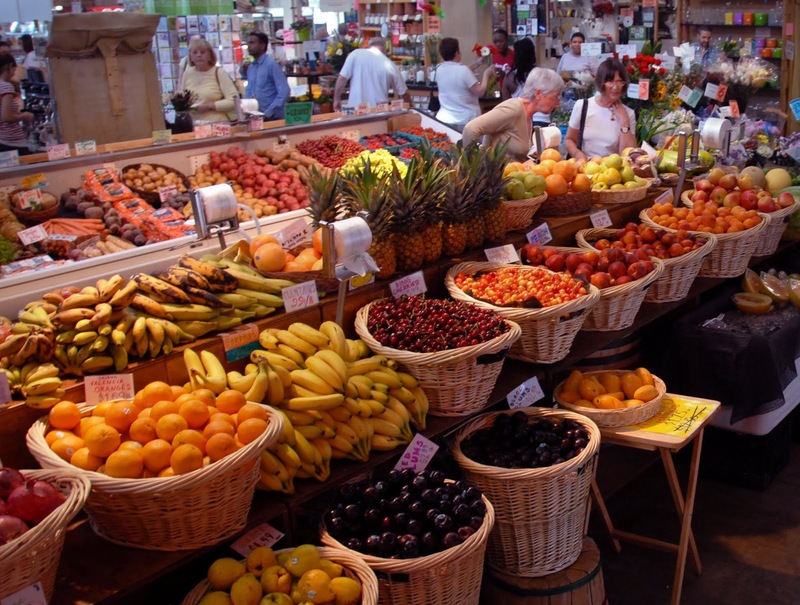 Open seven days a week, the market welcomes one million customers annually. Produce at the North Market. Courtesy: Brand Columbus. 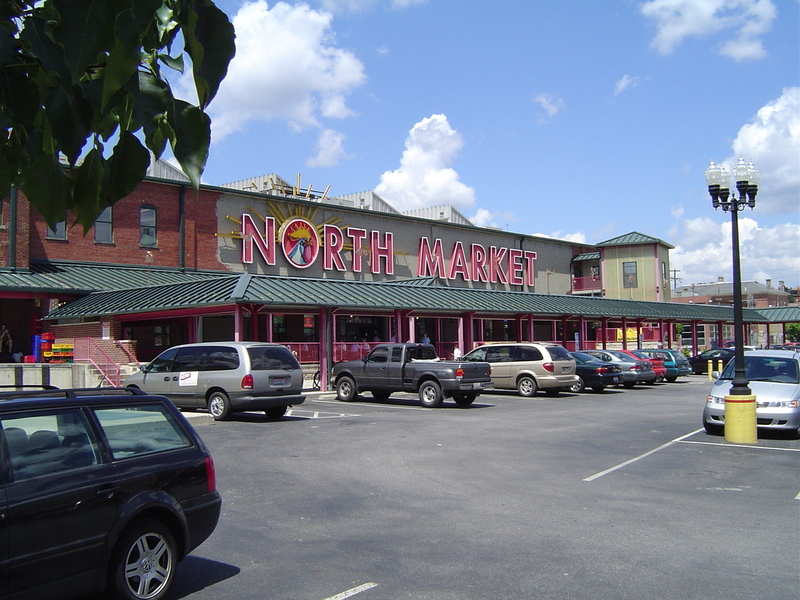 Unlike many of the markets in the Central Pennsylvania region, you’ll pay for parking at the North Market, but not enough to break the bank. The first hour will cost you $1, with subsequent hours costing $2. Of course, you can avoid that through ticket validation and the vendors are always happy to provide that service. Baked goods, Ohio-raised meats, pasta of all shapes and sizes, prepared foods and ethnic specialties engage the senses so lunch choices can be difficult. I settled on a tasty Greek salad from Firdous Express and was soon on my way to the next destination not far away at the “Arena District,” to check in at the centrally located Crowne Plaza. Staying in the Arena District is a good choice for anyone who wants to be within an easy drive of The Columbus Zoo (20 minutes), German Village (10 minutes), or Victorian Village (five minutes). To experience how the locals live, consider a visit to Katalina’s Cafe . Located in the Victorian Village in a renovated 100-year-old gas station, Katalina’s is known for its funky décor and its locally sourced, made-from-scratch cuisine. Breakfast specialties range from huevos rancheros, a hearty dish which I enjoyed, to various omelets and popular pancake balls made with local stone-ground flour filled with Nutella, dulche le leche, or pumpkin apple butter. Katalina's Cafe in the Victorian district. Huevos Rancheros served at Katalina's. The quirky décor features chalkboard walls with an array of colorful designs. On nice days, diners can enjoy al fresco dining and socialization on the deck. The surrounding neighborhood is a good place to walk off some of those calories and lay eyes on some of the best examples of domestic Victorian Era architecture in the country. A trip to Columbus isn’t complete without a visit to the Columbus Zoo and Aquarium and if you’re lucky, you just might get a glimpse of President Emeritus Jack Hanna, who maintains a basecamp onsite and visits for special events. The impressive collection of wildlife from around the world is separated by regions like the Congo, Asia, Africa and North America. Knowledgeable staffers are stationed throughout the park to help visitors navigate the territory, or learn more about the animals. Flamingos frolic at the Columbus Zoo. A lion takes a snooze. A gorilla seems bored with being ogled. Plan to wear comfortable shoes and to spend at least four hours viewing the exhibits. 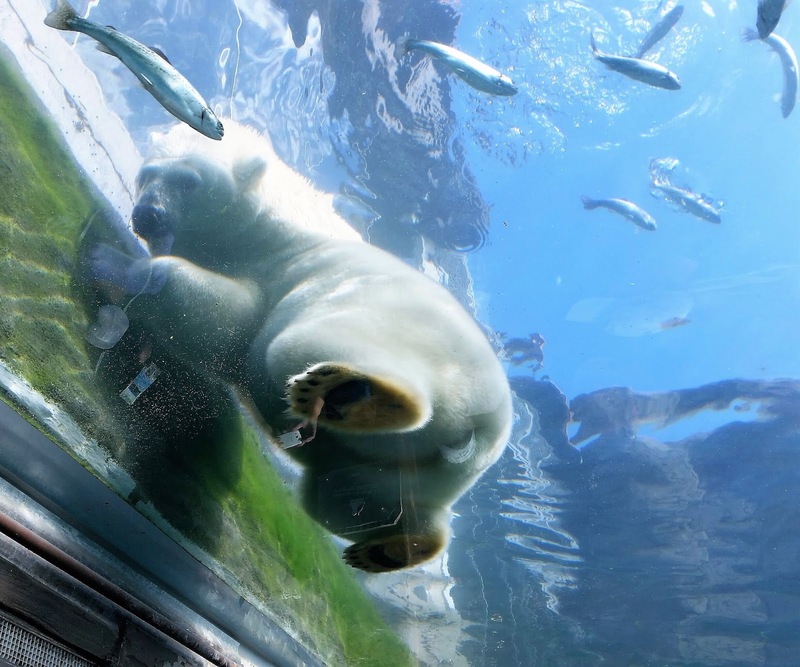 Not-to-be-missed is the $20 million “Polar Frontier,” where guests can view the polar bears at eye level, or observe them frolicking in the water from below, courtesy of a clear glass tank. Families often enjoy cooling off at the nearby 22-acre Zoombezi Bay waterpark complete with 17 waterslides. Lockers for storing gear like cell phones, credit cards and wallets are available for an additional $10. Children whoosh down a water slide at Zoombezi Bay. Photo courtesy: Brand Columbus. During your visit, plan to spend some time exploring the historic German Village. 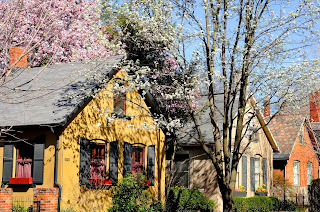 For a self-guided walking tour, pick up a map and tickets at the Visitor’s Center in the German Village Society Meeting Haus located at 588 3rd Street. On the tour, you’ll learn about historic architecture and how early German residents lived and worked. Food and drink stops are recommended along the way. For authentic German food, look no further than Schmidt’s Sausage Haus at 240 E. Kossuth Street, where Adam Richman once indulged in the Autobahn Buffet for an episode of “Carnivore Chronicles.” Visit during the evening from Wednesday through Saturday and step into an Oktoberfest-like atmosphere, complete with live oompa music. For bibliophiles, a must stop is the Book Loft, one of the nation’s largest independent bookstores. Housed in multiple pre-Civil War-era buildings, it’s easy to spend hours browsing from among the plethora of titles in 32 rooms. Be sure to grab a directory located near the front register to navigate your way around the mysteries, histories, and many other genres available for your reading pleasure. The Book Loft is one of the nation's largest independent bookstores. Scenes from the Topiary Park. The brainchild of local sculptor James T. Madison, the Topiary Park was inspired by Georges Seurat’s Post-Impressionist Painting, “A Sunday Afternoon on the Isle of La Grande Jatte.” The garden is comprised of 54 human figures, eight boats, three dogs, a cat and a monkey and is best viewed in the summer months. The 320,000 square foot structure known as the Center of Science and Industry (COSI) is one of the largest, modern-built science centers in the United States and was named by Parents Magazine as America’s number one science center for families. Butterfly made from recycled materials. 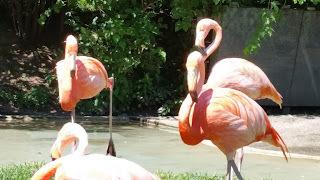 During my visit, the science museum and research center was hopping as children dashed from one exhibit to another to experience hurricane force winds in a wind tunnel, play a laser harp, ride a unicycle and gaze at the "sky" in the planetarium. There were just a few of the many family-friendly educational activities available. 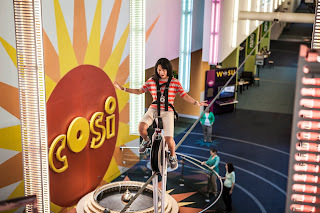 A child rides a unicycle at COSI. Courtesy: Brand Columbus. 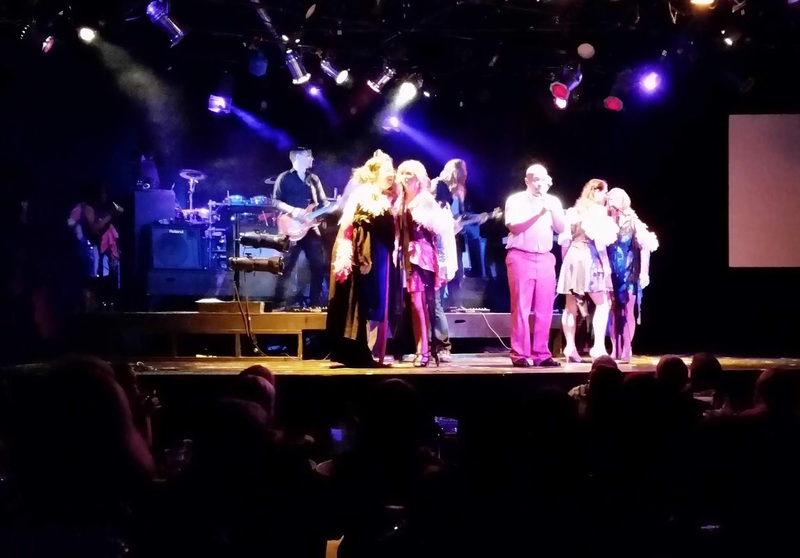 For a fun, adult night out, consider purchasing tickets to Shadowbox Live, the largest resident theater company in America. The non-profit, award-winning, performance troupe employs dozens of full-time ensemble members who entertain close to 100,000 patrons a year. 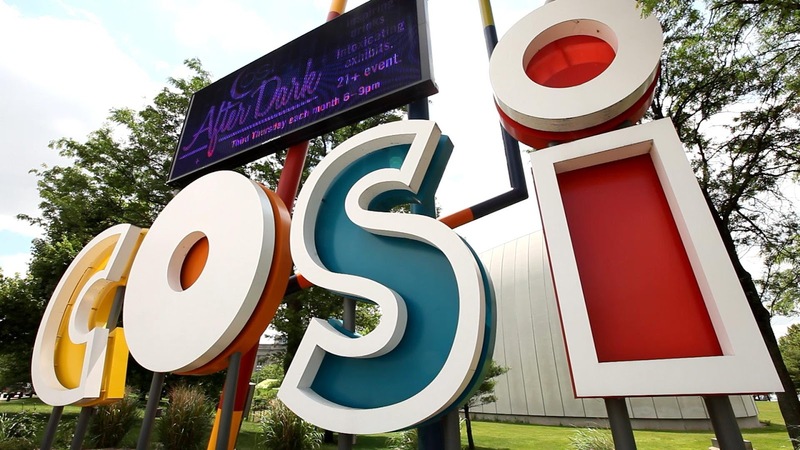 Theater lovers travel from miles around to visit the venue located in the Brewery District. Comedians perform at Shadow Box Live. Multi-talented troupe members wow the audience with original sketch comedy penned by a top-notch writing team. The house band, “Bill Who,” provides the musical backdrop for a variety of show-stopping song and dance numbers featuring the cast. Video shorts are shot and edited in house. The fast-paced show doesn't disappoint. If you find yourself like me--unable to get away for an entire week, these are just a few suggestions to make the most of your time. I, myself, was glad to take a whirlwind tour of the area to get a feel for much of what the city has to offer and now I have an idea of what to see when I return.